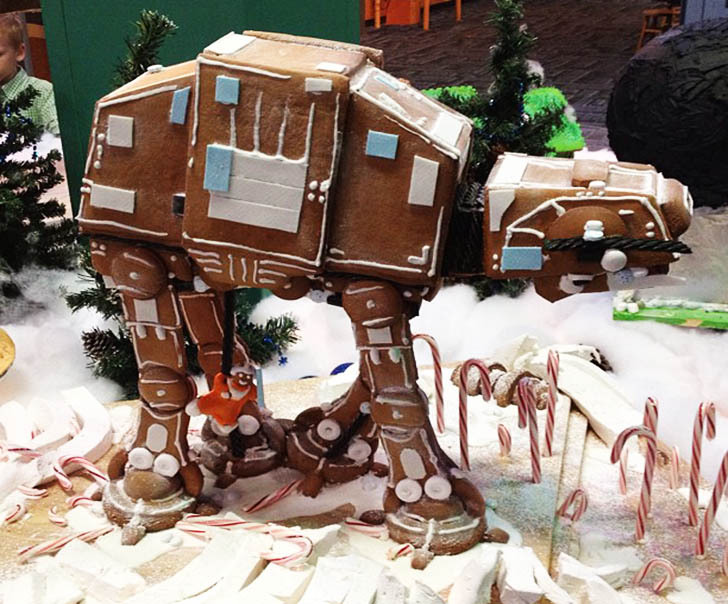 For the holiday season, Blackmarket Bakery owner Rachel Klemek made this — dare we say it — adorable AT-AT from gingerbread. In Klemek’s depiction of the infamous Battle of Hoth, the Star Wars assault vehicle can be seen traipsing over a field of candy canes and taffy, leaving a trail of destruction in its delicious path. The scrumptious scene also depicts a Rebel Alliance Snowspeeder wrapping a licorice tow cable around the AT-AT’s legs — so like the movie, will this be the sweet demise of the Imperial Walker? Maybe, but we think it could go down just as easy with a glass of milk. Any way I can get the pattern for my wife and kids to try? I now have "Walkers in a Winter Wonderland" stuck in my head. Cute. For the holiday season, Blackmarket Bakery owner Rachel Klemek made this -- dare we say it -- adorable AT-AT from gingerbread. In Klemek's depiction of the infamous Battle of Hoth, the Star Wars assault vehicle can be seen traipsing over a field of candy canes and taffy, leaving a trail of destruction in its delicious path. The scrumptious scene also depicts a Rebel Alliance Snowspeeder wrapping a licorice tow cable around the AT-AT's legs -- so like the movie, will this be the sweet demise of the Imperial Walker? Maybe, but we think it could go down just as easy with a glass of milk.